Display your finest bottles of wine and liquor with this clever Floating Wine Rack. 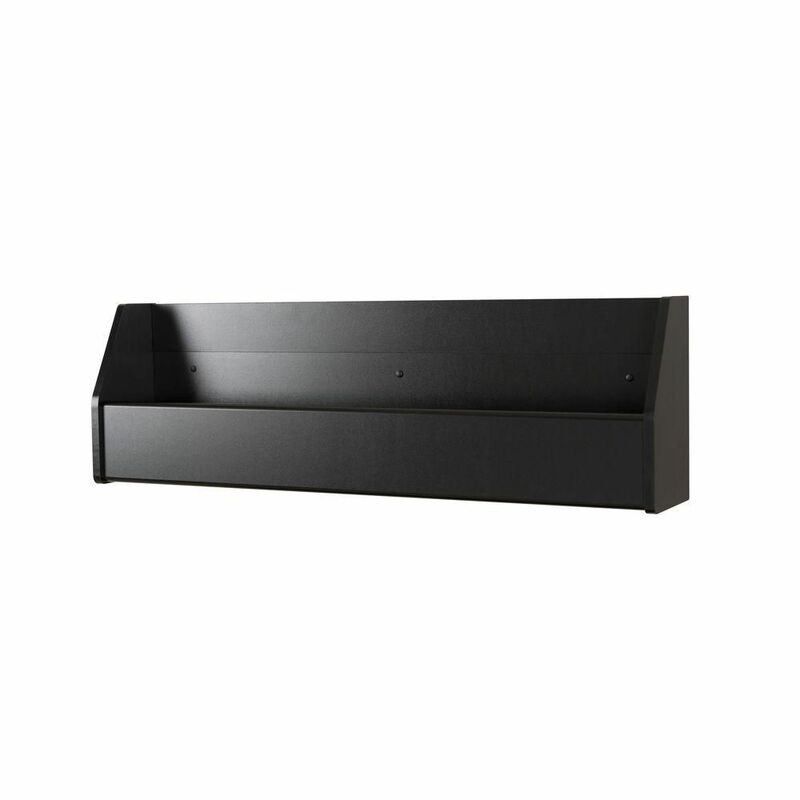 This wall mounted rack has a compact design to conserve space in your bar, living room, kitchen or dining area. With its sturdy construction you can display up to 18 standard 750ml bottles of wine or spirits. Keep a variety of stemmed glasses at hand by sliding them into the hidden channel underneath. This product ships "Ready to Assemble" with an instruction booklet for easy assembly. Installation is easy with Prepac's hanging rail system. 5-year manufacturers limited parts warranty. The Essence Wine Cabinet is the perfect dining or living area companion. A bit of Mid-Century modern craftsmanship melded with seamless design composition, take this casual wine cabinet to the next level. Glass and oak shelves, and splayed legs, add texture and detail, while ample storage space is suitable for displaying drinking glasses, candy dishes, dinnerware, and all your other entertainment needs. Display five of your most prized wine to share amongst family and friends, as this piece draws people together. Built for the entertainer and thoughtfully designed for the wine lover, The Joy Wine Cabinet is the perfect dining room addition and serves as a functional showpiece that blends well with any decor. Featuring four open shelves that allow for ample storage and displaying wine glasses, platters, or dishes, while a bold smartly slotted shelf, holds six bottles of your best wine. An artful off-white cubed space, spotlights your favorite pieces, adding a touch of playfulness to this quality crafted cabinet. Two tempered glass doors equipped with sleek chrome handles, open at a convenient ninety degrees, and metal legs help keep this freestanding unit current. The Lund Bar Cabinet 12.0 is created for the entertainer and built for the wine lover, boasting 12 slots to showcase a growing wine collection, with place for each bottle to rest between celebrations. Modern with a hint of classic mid-century flair, the piece stays true to design and focuses on durability using solid wood and careful craftsmanship. A functional, high quality piece, featuring clean styling, this bar cabinet blends with any decor and space. Available in white and rustic brown or aqua and rustic brown. Floating Wine Rack In Black Display your finest bottles of wine and liquor with this clever Floating Wine Rack. This wall mounted rack has a compact design to conserve space in your bar, living room, kitchen or dining area. With its sturdy construction you can display up to 18 standard 750ml bottles of wine or spirits. Keep a variety of stemmed glasses at hand by sliding them into the hidden channel underneath. This product ships "Ready to Assemble" with an instruction booklet for easy assembly. Installation is easy with Prepac's hanging rail system. Floating Wine Rack In Black is rated 4.3 out of 5 by 4. Rated 4 out of 5 by Hallockg from Picked up this order today, assembled it and hung it on the wall. Instantly it changed the look o... Picked up this order today, assembled it and hung it on the wall. Instantly it changed the look of my dining room. Satisfied that I purchased this wine rack.